Vanished Lands by Composer Neil Martin commissioned by Wicklow County Council under the Per Cent for Art Scheme on behalf of Music Generation Wicklow premiered in Tulfarris Hotel, Blessington Lakes, 6 July 2014. Wicklow County Council of behalf of Music Generation Wicklow commissioned composer Neil Martin to engage with young people attending the traditional music groups: Club Cheol na Lochanna and Music under the Mountains. 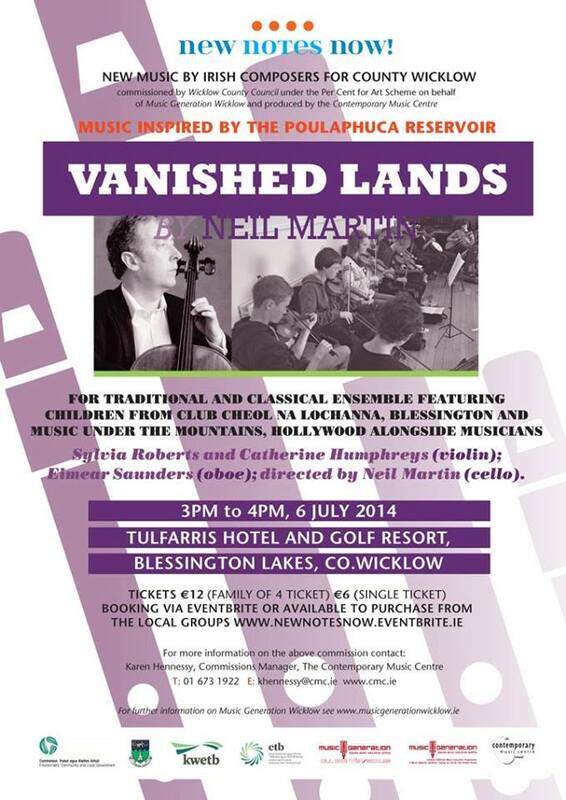 The result is a new work for classical and traditional ensemble, entitled Vanished Lands – Music inspired by the Poulaphuca Reservoir. It was performed featuring a trio of professional musicians performing alongside the young people: Sylvia Roberts and Catherine Humphreys (violin), Eimear Saunders (oboe) and directed by Neil Martin (cello).